Integrity built to last and outlast the competition. BK Honeycomb Firing Trays can withstand countless firing cycles without breaking down and remain intact after constant usage. With two different peg sets available, firing has never been safer and easier. Confidence is natural when working with our trays. Made from a high grade ceramic material, our trays are able to withstand high temperatures. High mechanical strength keeps our trays from breaking apart under the hottest circumstances and over long periods of time. Our trays offer sealed edges for extra durability. With even heating and cooling, our Honeycomb trays produce solid results.Firing is efficient, as our white color reflects heat onto restorations. Our variety of peg and sleeve options give you the proper support needed, even for larger crowns. Custom work needs custom options. All of our trays work with our Fiber-Free material to ensure a non-stick experience and quality results. Our metal pegs are easy to use, can be bent as needed to provide the necessary support, and come in a variety of sizes. 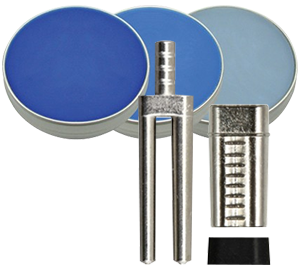 With Set A, pegs are specially treated and are a great choice for all types of cases, including pressable ceramic and other all-ceramic materials.